THE News & Mail has teamed up with the Rotary Club of Woking District to give four lucky speed fans the chance to win tickets to a lecture by British record breaker Richard Noble. Noble is the director of a project that is developing a high-tech car designed to reach a speed of 1,000mph. 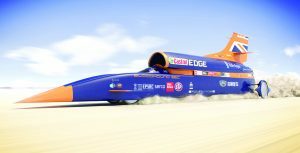 He is the keynote speaker at the prestigious lecture: Bloodhound SSC – The mission to break the land speed record. The event, organised by the Rotary Club is at the HG Wells Conference and Events Centre in Woking on Thursday 25 July. See the 24 May edition for how to enter our competition.